selects direction of filter sweep : upwards or downwards. Normal mode allows setting the Gain control without changing the output volume. Determines frequency peak of filter. Makes more "effected sound" when turned up more. Functions as both a volume control and a filter sensitivity control in boost mode. In normal mode it acts only as a filter sensitivity control, unlike the Mutron-III which also changes the unit's output volume. Emphasizes vowel like sounds in low position, overtones in high position. Select the filter used by the effect: Lowpass, Bandpass, Highpass or a mix of Bandpass with dry unprocessed sound. 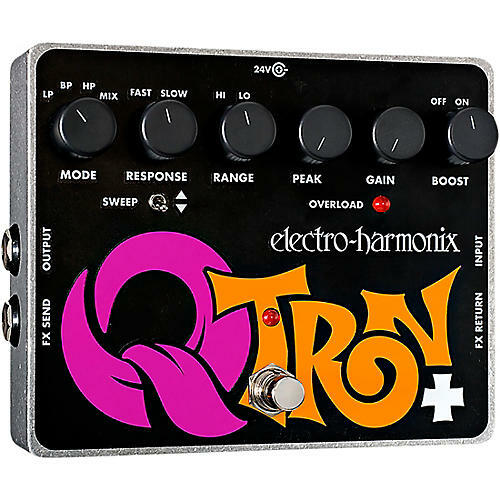 Selects either a slow, smooth, vowel-like attack or the fast, snappy response of the original Q-Tron.